More than 50 million Americans suffer from high blood pressure, and most of them control it by taking prescription drugs with potentially dangerous side effects; and nearly 24 million Americans have diabetes. 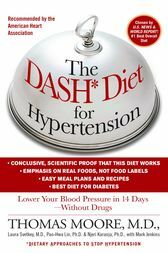 But there is a natural and affordable alternative for managing these potentially deadly conditions, reducing your risk of heart failure, stroke, and kidney disease, and achieving the best health of your life: the DASH (Dietary Approaches to Stop Hypertension) diet. • Key tools including calorie worksheets and a formula to calculate body mass . . .
and much more from this revolutionary program, which is recommended by the American Heart Association; the National Heart, Lung, and Blood Institute; the American Society for Hypertension; and other leading medical authorities.